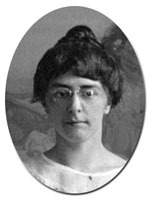 Alice Blinn (1889 - 1982) attended the State Normal School at Cortland before coming to Cornell to receive a B.S. in Home Economics in 1917. During World War I, she was an Emergency Home Demonstration agent and an extension instructor. At Cornell, as head of publications and publicity, she was in charge of producing extension pamphlets. Later in life, Blinn became a university trustee. In her will she left money to the Cornell Plantations and to the A. D. White Center for the Humanities.